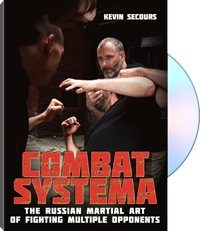 Combat Systema: The Russian Martial Art of Fighting Multiple Opponents is based on the Systema multiplicity principle wherein a fighter always tackles plural engagements with elliptical, figure-eight strikes, moving from one attacker to another. Taking the tactical approach from pure Russian Systema – preemption, detection, and cracking of the mob – Secours then focuses on the structure of the attackers' group and the dynamics of the real-world encounters. From verbal de-escalation, shielding drills, striking drills, and counterstrikes to multi-line defenses, anti-grappling, and tactics for protecting friends, this video delivers a coherent system of surviving an attack by multiple opponents.